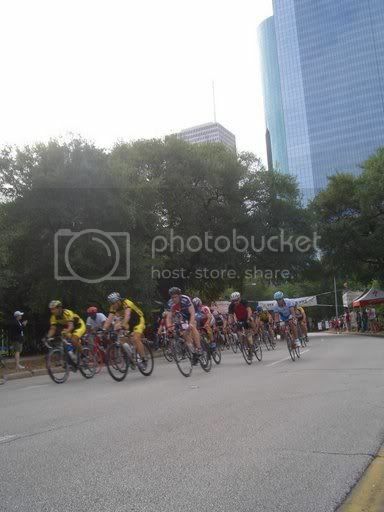 I rode in the Houston Grand Crit today, my 4th race ever and my second crit (my first crit experience lasted about 10 minutes, but let's not talk about that one). I finished with the pack, coming in 20th in the Cat-5 race. My first time finishing any race with the pack, and the first time I placed in the top 1/2 of the field (20th out of 49 finishers). The route was awesome, a long, straight parkway down-and-back, with 2 90 degree turns on each end of the course. I almost went down once, getting both my wheels stuck in an expansion joint for a second while trying to get onto the exit ramp at Montrose... a little scary but no problems. At first I was happy with 20th, but it turns out I had a lot left at the end of the ride... I guess that's what I get for racing to finish instead of racing to finish well. A little more attention to my positioning in the pack and I could have finished at least a few places better. I guess I'll have to consider that next time. Also, I met another BF'er at the starting line, Houston Biker. Always great to meet y'all out on the roads! Anyone else have reports about either of the crits in Houston this weekend? there for the finish!!! Very cool!!! You raced a great race today. I was watching you move up on the backside of the final lap and you played it very well getting into good position for the final couple olf turns. I tried to come around you at the finish but you were too strong! Well done! The race was well organized and the course was good. I had a couple of scares when I locked elbows with a couple riders on the last lap but I guess that is to be expected in a crit/circuit race. I did the 4/5 35+ and the 5 race and finally got enough races to cat up to a 4. That said, they did a great job running the race, officials and all were great. I'll be back next year if they change venues again, but probably not to that same venue. UT Dude, I think the "boringness" of the course was one of the reasons I was able to stick with the group! Being a big guy, slowing down and accelerating over and over again isn't quite my forte. I was a bit surprised at the lack of attacks in the Cat 5 race... it seemed like no one was really trying to get ahead until after the very last turn of the last lap. I was expecting to struggle to hang on to the group, when I actually ended the race feeling like I could have done another 40 minutes. Chris, did you crash or just get run off the road? Sorry you had a bad outcome. I agree it was a pretty bland course...unfortunately, Houston has no elevation changes and the course, being an up and back, didn't offer a whole lot of variety. Man - wish I'd made it out. Just run into the curb. Me and the bike are fine, it just stole all my speed via my tire LoL. I'd have been much happier with a 4-corner crit. Wasn't worth a 6 hour drive for an hour of sit and sprint with no corners. Not technical, and really, not even hard to hang with it. I did the M35+ 1/2/3 and got 9th. Even though our average speed was 27mph, it wasn't fast enough to prevent a chaotic swarm into the final two corners. Guys crashing all around me. I felt like the Millenium Falcon escaping the exploding Death Star. I think six or so guys hit the deck just from sliding out (the last lap). We hit the final two corners at 35mph, and the paint stripes just didn't work for everyone. I had some elbow bashing going into that one, which is kind of fun and frustrating at the same time. I won back my entrance fee plus enough to take my 6-yo son out to Burger King for the long drive back to Austin. It was a really easy race until the last 4 minutes. Much faster and easier than yesterday. Good fun. It looks like I can consistently contest M35+ now, amongst the 1s and 2s. That's a good feeling. I'm jonesin' for some teammates though. We had at *least* 4 crashes. We didn't really drop anyone, but started the race with 60 and finished with about 30. That many people gone to crashes. Suuuuuper sketchy. I raced the 35 4/5 and 4's yesterday. Even got to meet the famous WR and Houston Biker. Pack finish in both races. The 35 4/5 was actually harder even with a lower average speed. Less riders, more time on the front for me and a longer sustained sprint to the finish left me cross-eyed and gasping for breath at the end. No crashes (that I heard) in either of my races, though I did take a flyer through the cones in the 4 race when someone swung wide into me in those final turns. Hey, it was nice meeting you out there. Good racing! For those not sure, Ivan's the one who's not on his hoods... (Ivan let me know if you want a big copy of that one). I've often found that with the same group of racers, a slower race is much harder than a faster one because of the surges. Thanks WR - you too. Your race yesterday looked like a strung out sufferfest, though it sounds like you felt better than you did at Bear Creek. At least we all avoided leaving any skin on the tarmac (Houston Biker and I got especially lucky we didn't leave skin at Bear Creek). I'll take ya up on that offer of a larger pic. PM me and I'll give you an email address. I won back my entrance fee plus enough to take my 6-yo son out to Burger King for the long drive back to Austin. Nice job guys except for UT Dude - sorry it ended badly for you. It was good meeting you at the Grand Crit! Dude - that sux. Heal up - we've got some racing to do. Nice meeting you too Houston Biker. Wow...took out more riders than I thought it did. If I had been positioned in the outside on that turn I would have been right there with you. Snuck through on the inside and lived to fight another day. Here's hoping for a crash-free season for all of us once the weekly Memorial Park crits start up. Things can get pretty scary there. Jvan, what's the rundown on the Memorial Park crits? Is it a tough course? What's the competition like?